Born a slave in Philadelphia in 1760, Allen bought his freedom and soon began traveling as an itinerant Methodist preacher throughout the eastern coast. While in a town near Philadelphia, Allen was asked to preach to a group of black congregants at St. George’s Methodist Church, a group that soon began to blossom. With the growth of this black congregation, Allen recognized the necessity of creating their own separate black church, leading to the creation (with Absalom Jones) of the Free African Society, a non-denominational religious mutual aid society for the black community. Eventually this society grew into the African Church of Philadelphia. 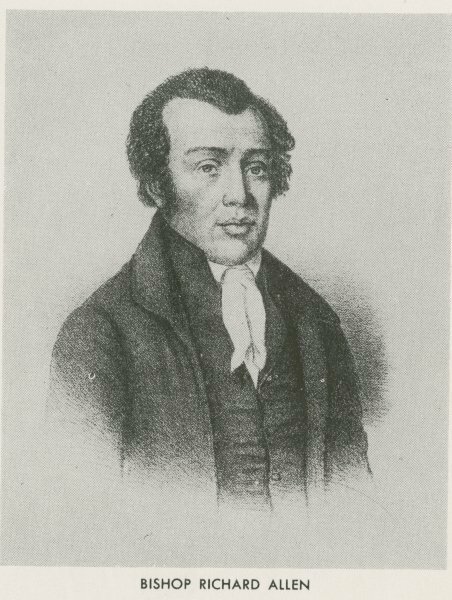 Allen continued his Methodist ministry, and seven years later, in 1794, founded Bethel, which became the “Mother” church of the African Methodist Episcopal Church, the first independent black denomination. Allen appears in this portrait as a stoic and thoughtful man, respectable in all manners of appearance. Dedicated to racial uplift and achievement for all his black brothers and sisters, Allen intentionally crafted his image as a model of a highly respected, pious, and socially minded African American.